The Canadian Forces who only “advise and assist” = arm, aim, assassinate, annihilate. 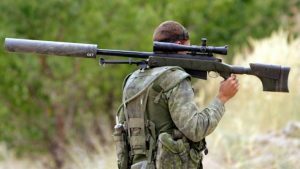 A Canadian sniper working alongside Iraqi forces in their fight against ISIS successfully struck a member of the militant group from a distance of 3,540 metres, Canada’s military confirmed Thursday. The sniper is a member of the elite Joint Task Force 2 special forces unit, but citing operation security the military provided no details about how or when the incident took place. The Globe and Mail first reported the sniper record Thursday and quoted unnamed military sources who said the kill shot disrupted an ISIS attack on Iraqi security forces. The shot surpasses the previous record held by a British soldier, who in 2009 shot a Taliban fighter in Afghanistan from a distance of 2,475 metres. Peter Stoffer says a judicial inquiry would shed light on the inner workings of many organizations including the Department of National Defence, the Department of Veterans Affairs, the Nova Scotia health system, and the mental health care system. The story about the sniper is clearly a piece of propaganda from military sources intended to boost the prestige of the Canadian military right when Trudeau is increasing military spending by 70 per cent over the next decade to $32.7 billion dollars. This new spending particularly emphasizes funding for special forces operations, so the placement of a news story promoting the “elite” nature of Canada’s special forces is hardly coincidence. The more than $30 billion in announced additional military spending over the next decade alone, most of which will be paid to the biggest arms monopolies, will result in the great parasitism of Canada’s economy and social wealth. This figure does not include costs related to future military deployments or any of the government’s subsequent “decisions related to continental defence and NORAD modernization.” Although it is a truism to note how far these sums of money would go towards providing for the people’s well-being, just as significant is the fact that this wealth is directed away from the all-sided development of the economy towards militarism. This story also induces some cognitive dissonance. When “kill shots” are being treated in the national media as though they are simply levels in a video game and not human beings being called upon to kill other human beings, it shouldn’t be any wonder that troops are returning with severe PTSD. In all the discussion of Lionel Desmond’s PTSD, there was little public discussion of what it is that we are sending troops into war to do. The vague idea that the Canadian public generally holds that we’re engaged in “peacekeeping” allows a distancing of the extreme and horrifying violence of combat, and the terrible things soldiers are called upon to do. There is little willingness to engage with the idea that if people are returning so deeply traumatized, maybe we should be questioning our involvement in military action and not just the mental health services available to veterans. Sgt Craig Harrison, who served in the army for 23 years, told ABC news that he felt like he was “hung out to dry,” when he was discharged. “They didn’t even say thank you,” he said. Over the course of his career, Sgt Harrison completed multiple deployments to Iraq, Afghanistan and the Balkans, the latter of which caused him to develop post-traumatic stress disorder (PTSD). Sgt Harrison said that his nightmares were related to the people he had killed, that “I can smell them, I can see them. Every person who I have taken their life”. That, of course, is conveniently left out of the news coverage of the current record holder. It’s a vicious cycle as those who go to war feel extra mental stress when they sense their sacrifice is unappreciated, and their cause diminished by post-war indifference. 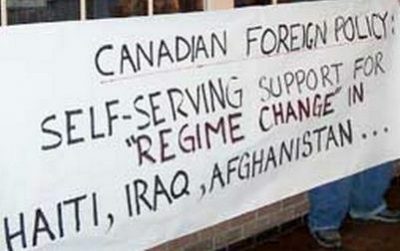 And it doesn’t help when Canadians talk a bold game about “supporting the troops” but don’t deliver. If the public doesn’t believe troops are actually engaged in combat, I imagine that makes it more difficult for people returning from war to actually speak about their experiences. If your family and friends believe you were out there “assisting and advising” and have no idea what you actually did, then I imagine it’s even harder to try to explain to people why you are so traumatized now. Meanwhile, spending for war is being increased while Canada buries the violent impacts of war, asking us to cheer on sniper shots like we’re watching a Hollywood movie while pretending that war is benign and that our “150 years of being nice” means that we must be peacefully and politely going about the business of war. So at the same time as we tell Indigenous women that equality costs too much, we increase military spending. At the same time as we pledge to make more war across the planet, cause more refugees, and impoverish more women and children, we brag about our supposed international reputation for being “nice and friendly.” We talk about the tragedy of the Desmond family, but turn around and rah rah killing in war like it’s the same as getting the record for most puppies walking at the same time, or most children jumping through a skipping rope. And while even talking about things like free community college education or a living wage or assistance levels that allow people some dignity is “puppies and rainbows,” we can spend billions of dollars to stoke global conflict. We treat joining the military like it’s a social program that solves issues of poverty or lack of access to education or “behaviour problems in youth,” so we can’t send mental health counsellors into Black communities, but we can tell Black men just to join up as the path to respectability and stability. We won’t pay for inquiries into deaths in prisons or deaths in nursing homes or from military PTSD – or pay to make the changes that presumably those inquiries would demand – but we have money for more drones. Austerity tells us there’s just no money for housing or for drug treatment centres so I guess people will just have to die in prison un-investigated, but we are bringing democracy and civilization to the rest of the world. And as we are inundated with celebrations of Canada 150, and told what a peaceful and welcoming country we live in, and how lucky we are to live in such a good country, and how we don’t have violence and conflict like other places, and as we erase histories of Indigenous genocide, we publish military propaganda pretending that killing people is some kind of game, but just as long as Canada is on top in the killing game, it’s all glorious and free. El Jones is a poet, teacher and activist in Halifax. She writes the Saturday Morning File for the Halifax Examiner, in which this article first appeared on June 24, 2017.